If you make an FEA (finite element analysis) you can see stress and strain in the structure. FEA is a very reliable tool for understanding how a structure is stressed and where the hot spots are. If there is only a static loading then you can compare the maximum stress with material data such as yield point and if the acting stress in the structure is below this – perhaps with a safety distance depending on the intended use - then you will have no Problems. It is a very different situation if the structure is dynamically loaded i.e. if time variation stresses are acting. In this case the change of stress is important. 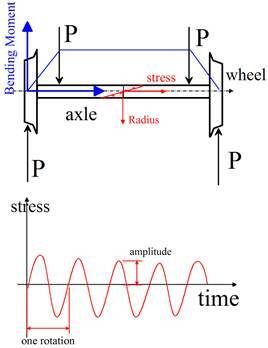 The following example explains this (see picture): a railway axle is loaded by a bending moment resulting from the acting forces in the wheels. This is a static load case when the vehicle is standing and the stresses are simple to calculate from the static bending moment just like in a beam. Above is pressure and below is pull stress. Watching a point on the surface when rotating, the stress alternates (see picture). This alternating stress acts while each rotation and the number of revolutions correspond to the number of stress-cycles. The stress amplitude a material can support over a large number of cycles is much smaller than the static yield stress. Furthermore, the stress amplitude is relevant for fatigue design and not the absolute value of the stress. This means that the location of failure resulting from fatigue effects must not be identical with the location of maximum static stress. Consequently a static analysis is not sufficient for a design of a dynamically loaded part. The stresses resulting from fatigue cause a crack on the surface which then grows into the component and reduces the area of the cross section. Depending on the number of cycles the area of cross-section becomes smaller and smaller and finally the existing area is no longer sufficient to support the loading and the part will break suddenly. This sudden damage can lead to bad accidents and technical history is full of examples. Planes, railway vehicles, oil-platforms failed because of exceeding fatigue limits and many people lost their lives in these accidents. The inventor of the fatigue phenomena was August Wöhler, the creator of S-N-curves, also known as Wöhler-Curves. August Wöhler (1819 – 1914) worked in the field of fatigue of railway components. Based on his work it was possible to create a theory which is most helpful when designing dynamically loaded structures.